Star Micronics Co., Ltd. is proud to announce the latest advancement in its product line, the “SM-S210i”, “SM-T300i”, “SM-T400i” and “TSP650II BI” to provide solutions to the rapidly growing market of smartphone/tablet POS and mobile payment. Since the first portable printers were released in the US market in May 2010, Star has expanded its share in the portable printer market including Japan and Europe. Many Star portable printers are used in the various applications such like “On Demand Payment Systems” for restaurants and fast food delivery service and receipt printing for product delivery service. And now, it is important to offer a solution for the new markets created by the advance of tablet computing and the demand for Bluetooth printers is rapidly increasing. Most of the customers in the markets are looking for some type of mobile solution, often involving products from Apple. The SM-S210i, SM-T300i, SM-T400i and TSP650II BI are Star’s first printers that are approved by Apple, Inc. These printers, unlike most printers, can pair via Bluetooth with the iPod Touch, iPhone and iPad. They have made it easier than ever to print from the Apple iOS devices that have become ubiquitous in the Point of Sale and Payment industries. Not only can Star’s SM-S210i, SM-T300i, SM-T400i and TSP650II BI printers pair with iOS devices but they also support the Bluetooth SPP protocol, meaning they can pair with devices running most other common operating systems as well. 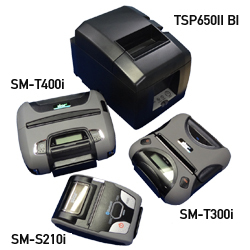 As one of the first printers available with both of these Bluetooth technologies in one device, the SM-S210i, SM-T300i, SM-T400i and TSP650II BI will make it easier for resellers to offer a simple hardware solution to merchants that is compatible with all of the popular mobile platforms. Able to communicate through Bluetooth with iOS devices (iPhone, iPad and iPod Touch). Able to switch from iOS support to other OSs to allow configuration of the printer and selection of either MFi mode or SPP for all other Operating Systems. Max. 80 mm/s for portable printers and max. 300 mm/s for a desktop printer. Able to read magnetic stripes (ISO/JIS II), ideal for a low cost payment system with smartphones and tablets. Operation time is a maximum 12 hours (5 minute printing intervals and energy saving mode) with one full-charge. Certified by the IP54 or IP40 international standard. * “Made for iPod”, “Made for iPhone”, “Made for iPad” mean that an electronic accessory has been designed to connect specifically to iPod, iPhone and iPad respectively, and has been certified by the developer to meet Apple performance standards. Apple is not responsible for the operation of this device or its compliance with safety and regulatory standards. iPod is a trademark of Apple Inc., registered in the US and other countries. iPod Touch is a trademark of Apple Inc. iPhone is a trademark of Apple Inc. iPad is a trademark of Apple Inc.
* The Bluetooth® word mark and logos are owned by the Bluetooth SIG, Inc. and any use of such marks by Star Micronics Co., Ltd. is under license. Battery running time may shorten depending on the operation environment temperature,operation condition and battery charge frequency.